Kernel extensions, called kext for short, are modules of code that are loaded directly into the kernel space of OS X, able to run at a low-level to perform a variety of tasks. Most kexts are part of the core Mac OS X system software, typically hardware device drivers, but some third party apps will install a kext as well. Sometimes, advanced Mac users and systems administrators may need to manually load or unload a kernel extension. Because kernel extensions are often critical components of OS X, this is only appropriate for users who have a specific reason to be modifying whether a kext is loaded or unloaded into the OS X kernel space. Inappropriate modification of kext behavior can render Mac hardware useless or inaccessible, and can also prevent OS X from functioning at all, so do not attempt to change any kernel extension without a compelling reason and understanding of what it’s usage is. Either way, hit return and with the entry of the administrator password the kernel extension will be loaded into OS X. This can be helpful after manually installing a kernel extension into OS X as in some situations it will prevent the need for rebooting the Mac. Modern versions of Mac OS X also allow kernel extension loading to be completed with the kextutil command, which is a bit more full featured for debugging reasons, but is otherwise the same for loading a kext. Again, you can confirm the kernel extension has been unloaded by using kextstat and grep, where it should return nothing. Do you know how to unload the kext for Thunderbolt? There are attacks that can be done if someone has physical access to the thunderbolt (or firewire) port, because those have direct access to main memory. I believe someone could theoretically obtain the filevault2 encryption key this way. I rarely use the thunderbolt connection, so I would like to disable it for daily use and only enable it when I need it. i have experience with someone doing just that. bluetooth is just as bad. I don’t load kernel extensions much, but I’ve seen plenty of poorly configured installers that want to quit the 15+ apps I’ve got busy doing other things. Good to know. Can unload webcam etc this way. If you don’t know what a kernel extension is or why you would load it, you should not load it. This is for advanced users, don’t load random kernel extensions ever, there is no reason to without a reason. (kernel) Kext com.apple.driver.AppleUSBTCKeyboard not found for unload request. 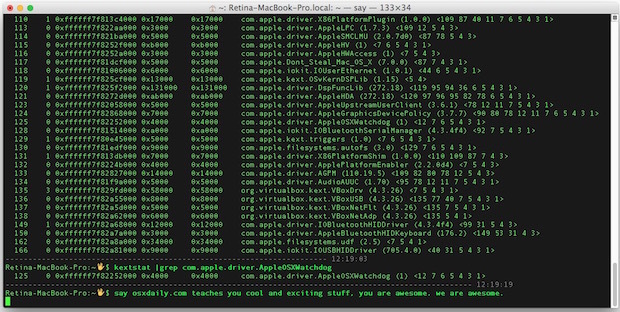 Failed to unload com.apple.driver.AppleUSBTCKeyboard – (libkern/kext) not found. List your kexts and make sure you are picking one that exists, it says it can not find the kext you are trying to unload. My Mac os x is not rebooting. I read somewhere that uninstalling kext files will help. Now it won’t uninstall. Uhm, you read wrong. Kernel extensions are an essential piece of Mac OS. That’d be like trying to start a car without an engine. And likewise if you aren’t a mechanic are you going to start yanking hoses and undoing screws in your car? Come on, think about it. If you do not know what you are doing you should never mess around with kernel extensions, it’s no wonder you Mac isn’t rebooting. You might need to reinstall Mac OS. Make sure your account has Administrators permission before doing that or sudo wont let you pass. If that doesnt work, I’d take your mac in to a genius bar or mac repair shop. will list all non apple kexts. Try unloading those, and ONLY those, or bad mojo will befall you. I’m an IT engineer of 20+ years and even I wont touch those apple kexts. Its a recipe for sad times. Hi there, how are you? Can someone please take a look and comment at this topic of mine? I can’t recover from this… I deleted a kext and the Mac won’t boot now. If you deleted kext and now it won’t boot… well you need to fix the system software. In this case; You must reinstall Mac OS if you deleted a kext file and the system will not boot any longer. In the future, never delete a kext file. Kernel extensions are required by Mac OS to work properly. The only kext files that can be removed safely are from third parties and even then they can break the app they are related to. Kernel extension modification is for advanced users, best to avoid if you are not fluent in their specifics. It is not a big deal, but it is complex and so that is why it is best to avoid. Never touch them. I would reinstall Mac OS, that will fix your problem. You can reinstall system software without formatting the Mac. wie und was soll ich noch installieren? vielen dank im voraus..
Hopefully a simple question. What happens when you unload the kext? I am thinking the associated file remains on the system. If so, how do I run a query to find all kexts that are unloaded? Hopefully a simple question. Once you unload a kext, how do you run a query to list all kexts that are available but unloaded? I found the answer to my question using ‘man kextfind’. I am posting this in case anyone ever has the same question after unloading a kext. The command ‘sudo kextfind -not -loaded’ will show all unloaded kexts. The command ‘sudo kextfind -report -b -loaded’ will list all kexts and a Yes/No column saying whether or not each kext is loaded. Replace or add ‘-print’ with the ‘-b’ option to display the path location for each kext.